SHIP BOTTOM, N.J. - April 9, 2018 - PRLog -- The Southern Ocean Chamber of Commerce continues their annual celebration of National Small Business Week in the Long Beach Island Region of the Jersey Shore. The Small Business Administration has been recognizing the importance that small businesses have on our national economy since 1963. Join Southern Ocean County Chamber of Commerce as it celebrates National Small Business Week with the region's Chamber Open House. Build your business with drop in sessions and meet one on one with Ocean County Score Professionals 11am – 2pm, on both May 2 and May 3. During your visit, learn about upcoming chamber programs and pick up latest information. The center is fully staffed and is located at 265 W Ninth Street in Ship Bottom. For over a century, the regional chamber has been providing the businesses of the area, innovative ways to stay on top of changes and demands that are part of owning or operating a successful enterprise in our area. Come out and see what we have planned for the rest of the year and leading into the regional organization's big 105th year of service during this two day open house event. On May 9, meet up with fellow businesses for signature drink the "Southern Ocean Comfort", happy hour style specials, table top and interactive exhibits. The evening will feature live streaming on site interviews, business for drone footage and expertise, photo booth and digital displays. Enjoy networking along with light fare and live feed broadcast and giveaways from sponsor Beasley Media Group/WJRZ , and a chance to win their $2500 advertising campaign. There will be plenty of opportunity to stir up new business connections. Event is open to the entire business community, $10 for admission to the event, with net proceeds benefiting our Chowder for A Cause partner charity David's Dream & Believe Cancer Foundation. ind out what services fellow business members have to offer at this one of a kind event. This specialty blended business to business expo and happy hour is scheduled Wednesday May 9 at the Mainland Manahawkin from 5-8pm. In honor of May's Small Business week, the chamber will be holding this event in lieu of their monthly meeting. 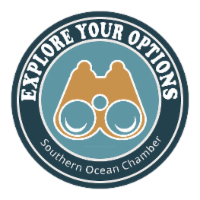 For more information on Southern Ocean Chamber go to www.visitLBIregion.com, follow on social as @southernoceanchamber , contact the chamber office at 609 494 7211.